A lot of people think "casino" when they hear Hard Rock, but the property is so much more thank slot machines, poker and black jack. Seminole Hard Rock Tampa has amazing restaurants, fun times at the pool and my favorite hiding spot, the incredible Rock Spa, which has been known to help melt my stress away. 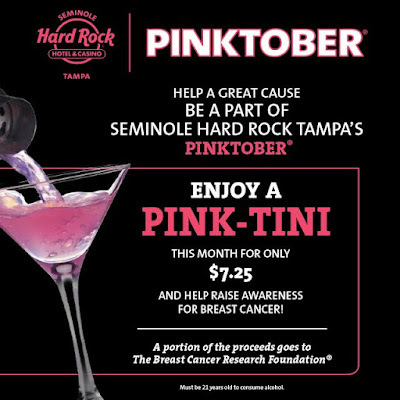 One of the things I love most about Seminole Hard Rock Tampa is their continuous support back to the community. They are one of the largest philanthropic companies in town and I love what they are doing to support Breast Cancer Awareness: Pinktober! Since Rock Spa is the closest Spa & Salon to my house, they are my go to for a quick fix. I recently tweaked my back/shoulder and they were able to accommodate my emergency massage appointment on a holiday weekend. Their Solid as a Rock deep tissue massage is my go-to during marathon training. They are able to target specific areas for maximum results. The therapist designs your session based on your needs. During the month of October, Rock Spa is participating in PINKTOBER®, to help fund research for prevention and a cure for breast cancer. They are launching a new scent called Pink Moscato AND Pink champagne will also be offered with certain services such as a Signature Pedicure (Walk This Way) and a Signature Manicure (Be Good to Yourself). By the way Tampa girls, they also do blowouts and professional makeup if you were looking to get dolled up for a big event! DRINK PINK! 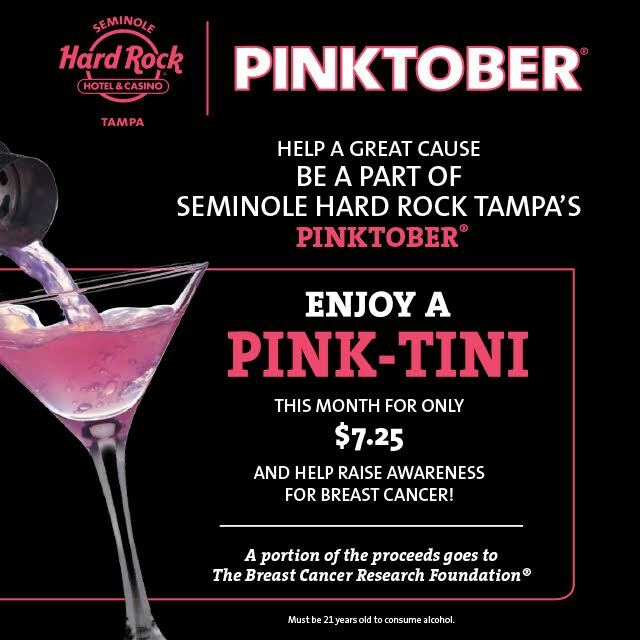 Pink-tini's will be available throughout the month of October for $7.25 and a portion of the proceeds will go to the Breast Cancer Research Foundation. 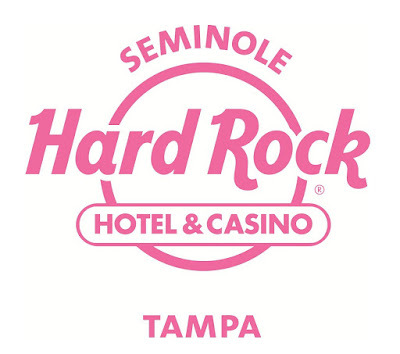 2015 will mark the 8th year Seminole Hard Rock Tampa has been involved in PINKTOBER®. Last year, the property raised more than $80,000 during its PINKTOBER® program. 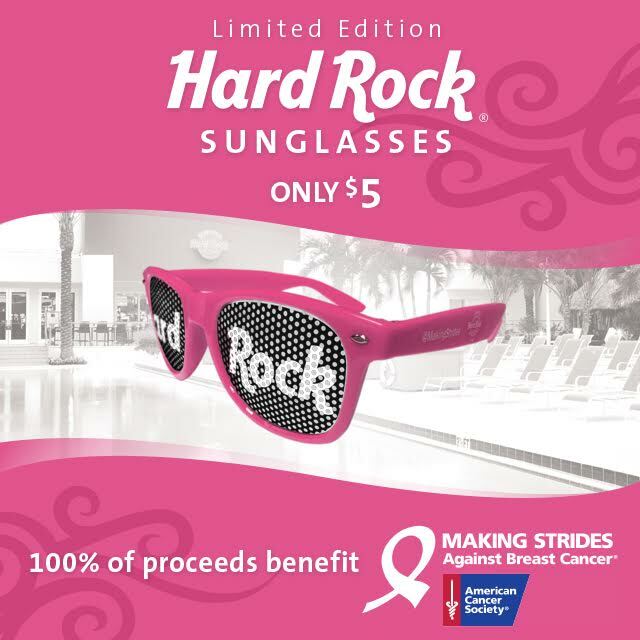 A major component of the program will once again be Seminole Hard Rock Tampa’s $50,000 title sponsorship of the American Cancer Society’s Making Strides Against Breast Cancer Walk, scheduled for Saturday, October 24, at Tampa’s Amalie Arena beginning at 9 a.m. Throughout October, the property will participate in Hard Rock’s “Get into Bed for the Cause” program which will offer guests luxurious pink sheets, pink duvet covers, pink robes, an iconic Hard Rock PINKTOBER® pin and a signature turndown service. When guests stay in pink rooms, 25 percent of the room rate goes directly to The Breast Cancer Research Foundation®. Additionally, a “Pink-Tini” will be sold during the month. Seminole Hard Rock Tampa will also be donating 100 percent of the proceeds generated from sales of limited-edition Making Strides pink sunglasses from the Rock Shop, as well as proceeds from sales of the “2015 Seminole Hard Rock Girls Calendar” during the month of October. 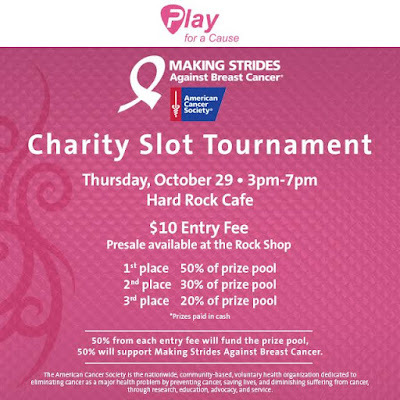 To further support PINKTOBER®, the property will host a wrap party which includes a benefit concert and slot tournament to be held at the Hard Rock Cafe Tampa on Friday, October 30, from 3 p.m. to 7 p.m. This event is open to the public. 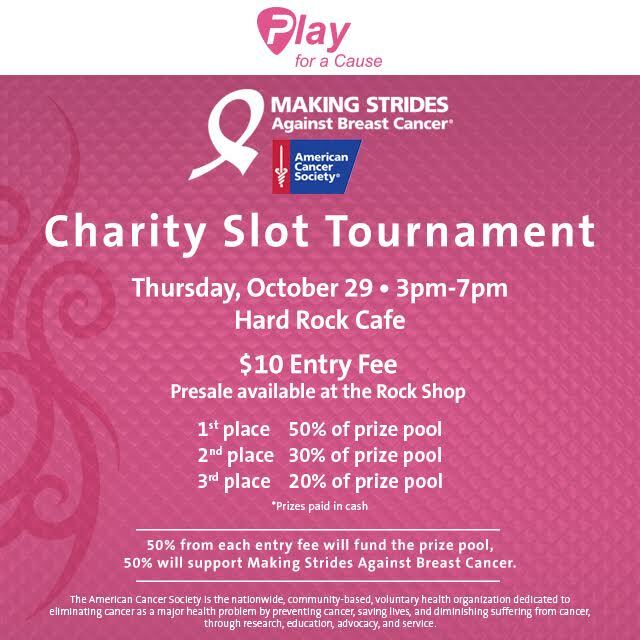 The entry fee for the slot tournament will be $10 and 50 percent of those proceeds will be donated to Making Strides Against Breast Cancer and 50 percent will be added to the prize pool. Tickets can be purchased at the Rock Shop beforehand or upon entry to the event. Free concerts will happen every Friday during the month of Pinktober at Hard Rock Cafe. 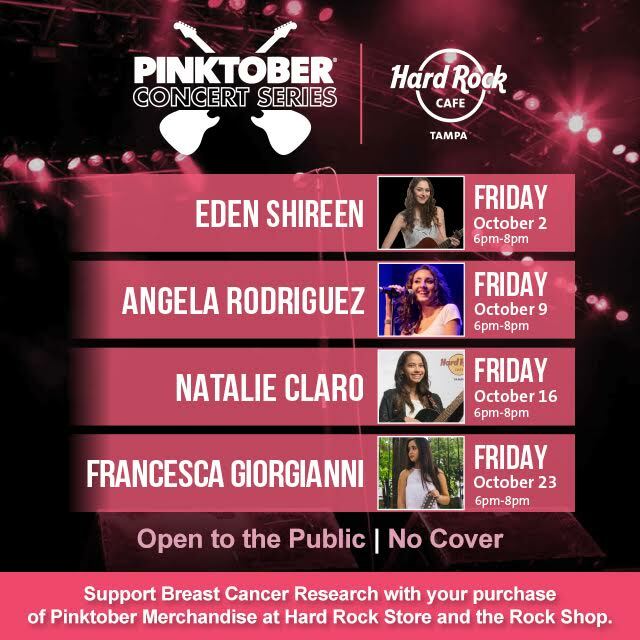 Be sure to support breast cancer research while you are there with the purchase of Pinktober merchandise at the Hard Rock Store and the Rock Shop!